Bonterra Trattoria – Buy a gift, get a gift! Buy a gift, get a gift! Throughout the Holiday Season, receive a $25 gift certificate with every purchase of a $100 gift certificate. 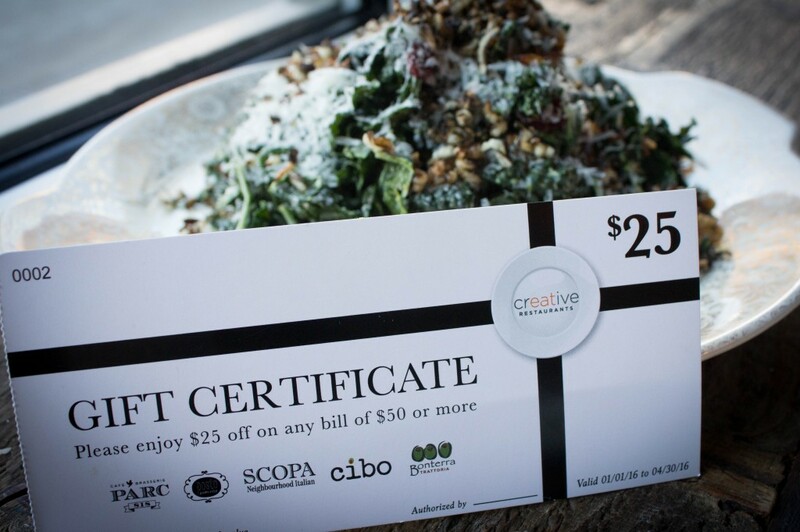 * With five unique restaurants to choose from, a gift certificate from Creative Restaurants truly offers something for everyone! Gift certificates available for purchase at Bonterra Trattoria, Posto, Cibo, Scopa and Parc. *25 gift certificate valid only on a purchase of $50 or more.